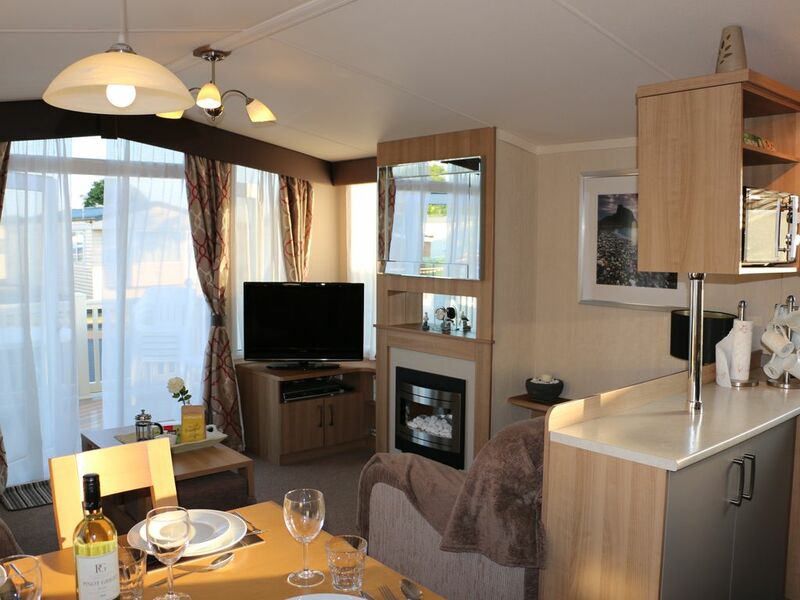 A lovely comfortable 4/6 birth caravan located on the award winning Hoburne, Naish holiday Park. From Naish holiday park you can find a private beach path way that leads down to the beach. A family friendly site with onsite amenities including; swimming pools, indoor and out, sauna and steam room, gym, arcades, soft play, restaurant and evening entertainment. Kids hour starts from 7pm with Sammy the sea horse and after the adults entertainment starts from 9pm. The holiday home has a lovely balcony to relax on and upon arrival a welcome pack of fresh coffee, tea and milk will be supplied. We provide hotel style white linen and towels and the ecological luxury Method hand soap in each bathroom. The holiday home is very comfortable and consists of a lounge area with two sofas, kitchen, 2 bedrooms, 2 bathrooms. Bedroom 1 is a double ensuite and bedroom 2 is a twin. The lounge area has an electric fireplace and a dinning area with seating for 6. The kitchen is fully fitted with electric oven and hobs. The kitchen is fully stocked with all the utensils/pots and pans one would need, even kids plastic plates and cups. We also provide a selection of DVDs to choose from and board games and cards. For children we have complimentary buckets and spades for you to take to the beach. We can supply cots and high chairs if need be. Parking out side is free and theres lots of it. There are no allocated spaces. Behind your holiday home you will find a large playing field to play in. If you walk 5 minutes you will also access the cliff top with stunning views of the Isle Of Wight/Bournemouth and Hengistbury Head. Guests can access the beach within 5minutes along Naish's private beach path that leads straight to the beach.. The holiday site has a local shop should you need it. If you would like access to the club house and all its facilities the passes are £15 a day for 6 people or 2-6 days for £40 for 6 people, these can be paid for after you have booked through air B n B in the resolutions centre, but this needs to be done 48 hours prior to arrivalYour host will be on call if needed. In your holiday home you will find a welcome pack of fresh tea, coffee and milk all the information about the surrounding area and information about your holiday home.Your holiday home is the perfect place to come and relax and listen to the crashing sound of the waves. From here you can also access the New Forest for walking/biking or horse riding or even a night out in Bournemouth or Christchurch.Parking is free outside and nearby. There is a large playing field behind the holiday home and a large kids play park within in the clubhouse grounds.Walking is easy around the site and you can walk for 5minutes and be on the beach or the cliffs edge with beautiful views of the Isle of Wight and Hengistbury head. All along the coast are great choices of restaurants, including the Noisy Lobster, and the Cliff Hanger. Your holiday home has a lovely sunny balcony to relax on. A very comfortable stay that all the family loved. Accommodation was very clean and well equipped. Great location and staff at the site were very friendly and helpful. Would highly recommend this as a place to stay for location for days out and for on site entertainment too.